Inflatable Tempest drive-away awnings quickly add extra space and shelter to a campervan that to air tubes with two-layer protection and Air in/Air out valves. 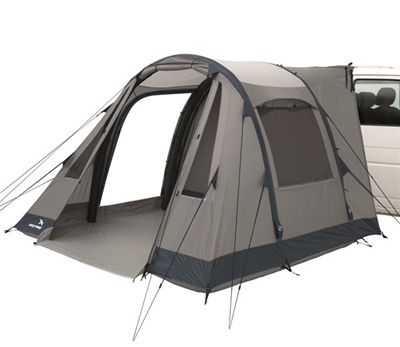 The Tempest provides a secure snug fit and features large double front and rear doors with lie flat groundsheet for easy access. Ample windows and air vents keep inside bright and airy, with curtains to maintain privacy when needed. Fast and easy to pitch, the new AIR COMFY MOTOR adds an extra room and versatility to campervans and MPVs without taking up a vast amount of valuable space in a small vehicle. Whether for dining, sleeping or storage, the two new inflatable drive-away awnings extend options for couples and families. Easy, secure, snug attachment to vehicles also enables fast detachment to leave the awnings erected on site to secure the pitch when out and about. Offering style, innovation and great value for money in practical designs highlighted by smart colourways, both feature robust air tubes with two-layer protection and easy operation valves, manual pump, sewn –in groundsheets and ample headroom.